My life changed on Sunday, July 16, 2000. Even though the official reports, the newspaper, and the family story all say July 17, my big cousin never saw Monday. After going to see the recently released film, Scary Movie, my younger cousin (his little sister) and I pulled into the driveway of my grandmother’s house around 11:45 p.m. not knowing that the next two minutes would literally change our lives. My younger cousin and I walked into the basement door as he walked out into what would become the final 30 seconds of his life. His murderer was clearly perched in the shadows of my grandmother’s carport, hidden by the fact that I chose to park on the opposite side of the driveway that night. What occurred after was a complete melee. A gunshot. A scene reminiscent of my worst nightmare; his mother hysterically trying to keep him alive, not knowing he was already gone. One of his little sisters running down the street, screaming right before she collapsed in the street while his other little sister and my grandmother prayed inside the house. All of this within less than five minutes of us walking into the door. According to the EMT, he was killed instantly. He never saw Monday. Since that day, I’ve been infrequently consumed with his last hours. What was he doing as the countdown on his life was in full swing? What was he doing when he had four hours left? Fifteen minutes left? I know he picked up a watch that he’d had repaired that day, and his last laughs were over the game of backgammon with his mother. By the time midnight rolled around and phone calls had been made, I lived in a world without my big cousin, and I couldn’t process it. The world felt emptier. In many ways, it still does all of these years later. That incident is as vivid in my mind today as the day it happened, the scars permanent. I had just turned 21 a month earlier. I could have died that night, so for many years, I felt like I was playing with house money. I was 21 and wasn’t sure if I’d make it to 29, the age my cousin was when he was shot and killed at my grandmother’s house on the west side of Atlanta in 2000. It wasn’t my first brush with death. A friend of mine accidentally killed himself with a handgun in high school when I was 16. But being present for my cousin’s death and the mayhem and the blood and the screams and the helplessness changed me forever. When I was 21, 29 seemed old. Or maybe my cousin just seemed old; he lived a lot of life. I’m 39 and now know that 29 is still a kid. You still have yourself to become. 29 is too young to die. I was walking towards the dentist chair for my appointment. I stopped. I literally stopped walking and immediately googled “mac miller.” The first article I saw was from TMZ, announcing that Mac Miller (real name Malcolm McCormick) overdosed. 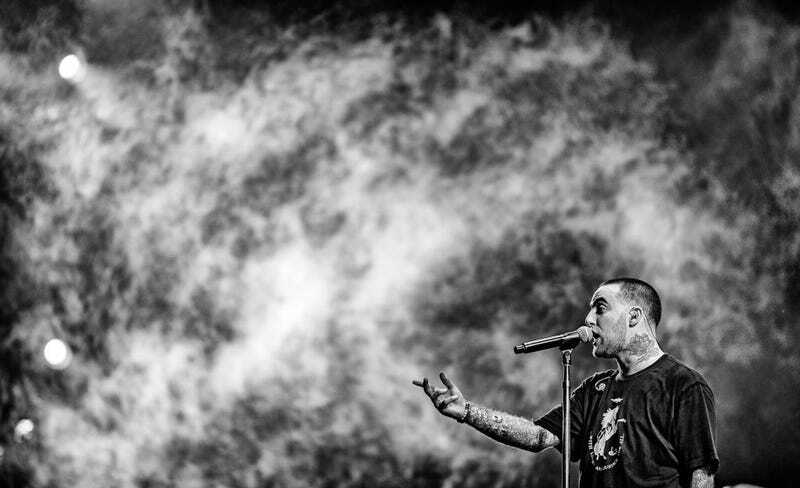 Mac Miller, the prolific rapper from Pittsburgh, was dead. He was 26. I’m a fan of Mac Miller. I listen to his albums and I have talked to others about his albums. He’d just dropped his album Swimming, one that I found myself particularly drawn to. I can’t quite explain it, but Mac Miller’s death hit me particularly hard. I can’t put my finger on why. All I know is that in the immediate aftermath, I was consumed with his death. I didn’t search his music for any sort of clues to his downfall; he’s had some very well known and public battles with addiction and substance abuse. But something stuck with me about the fact that Mac Miller, this young, promising, talent who was apparently loved by every rapper, is no longer with us. While it is very common for everybody to exclaim how much they loved a person after they pass, the love and praise for Mac seemed extremely genuine and sincere. Folks who had the pleasure to know him really liked him, and in some cases loved him like family. For real. I know that doesn’t provide solace to his family. I can’t imagine what they’ve gone through, though I suppose I can to some degree. I’ve seen up close and personal what happens when a young family member passes before what we presume to be his time. In Mac’s case, we have a catalog of music and a recent release to listen to and appreciate. Swimming is an excellent album. He’s had a bunch of really good albums, but this one moves me. For his family, maybe the music helps. Maybe. He’s not here anymore, and maybe they can take solace in that so many of us were and are affected and moved by him while also listening to his music and hearing the growth. Even at 26, he’d grown substantially as a human being, artistically. That’s no small feat. I didn’t know him on a personal level so I can’t speak to his everyday life, but every single person who has spoken about knowing him has done so with nothing but the kindest of things to say about his heart, generosity, and soul. I don’t know exactly why I care so much, but I do. 26 is too young to die. While writing for me is a job and a passion, it has also granted me the opportunity to live a longer life than earth will allow. And some of that is by design. Once I discovered writing and my talent for it, I fell in love with the exercise of wordsmithing. But when my daughter was born, I had purpose. I was 29 when she was born (and have since had two more children) and because of my cousin’s death, I always maintained a sort of morbid view on my own life. But every year past 21 I’ve managed to reach is me thinking more and more that maybe I’m not playing with house money...maybe I’m supposed to be here. To hedge that bet, though, I have created so much in so many different ways that should I go early, my children can read, at this point, 14 years of my life’s journey and hear their father’s music and where my mind took me. I can live forever, or at least as long as my family needs me too. And I don’t take that for granted. In my life, July 16, 2000, looms large in a way that I imagine September 7, 2018, will loom large for Mac Miller’s family. Fans near and far were moved, but his family will have to live with it in a way the rest of us can never truly understand. For many of us, he was a rapper we liked and loved and enjoyed. We loved his music, and we’ll always have that. We will miss what he could have done. I think that much like many young deaths, and thus the rub, who knows where he was going and where he’d take us when he got there. But even more importantly, he was a young man dealing with demons and seemingly working through them. There’s something sad about not getting to the other side of that work. It hit me hard and maybe I’ll figure out why one day, but for now, I’ll keep swimming. And I’ll keep thinking about how much life means to me at this point. Godspeed to Mac Miller, and I hope he now has whatever peace he was ever in search of. It’s been almost five months since he passed, and his death still resonates with me. When Tupac and Biggie passed away, they were almost a decade older than I was, so 26 seemed like full-fledged adulthood, almost otherworldly when I was 17. But now I know better. Looking from the position of having lived a lot of life and knowing how much more I have to live, I constantly come back to one thought, in particular, about Mac Miller’s passing: 26 is too young to die. Dear Writers, What Do You Have Saved in Your Drafts?